Calligraphy is in the midst of a renaissance, partly due to the idea that there is no wrong or right way to write a letter. Historically calligraphy was rather inflexible, with established letterforms being copied precisely, with the aim to make every letter the same. It was all about getting the correct form. Using dipping pens with a pointed nib instead of a broad edge nib, you can create curved hairlines, thick and thin strokes and elegant flourishes. Most of all you can find styles that suit you, and make it your own. So throw away that rule book! Now you can get results without years of study. A dip pen has tines, the two sections that end in a point. It has a reservoir- the gap where the tines join. The ink will sit in there when you dip into your ink. Fill your pen so that the reservoir is full. Aim to write a word or two with one dip. Sit up straight, sit near the edge of your chair. Hold the pen with a relaxed grip. Hold the pen nib straight out in front of you, so the tines are able to open when you pull the pen downwards, to give you a thick line. Allow your fore arm to glide over your desk, rather than leaning on it. You can move the angle of your forearm and hand, to make different strokes, but always keep the pen at the same angle. Move your arm from your elbow for short movements across the paper, and from the shoulder for long movements. Think of calligraphy as painting, not writing. Concentrate on the shapes you are making and go slowly. 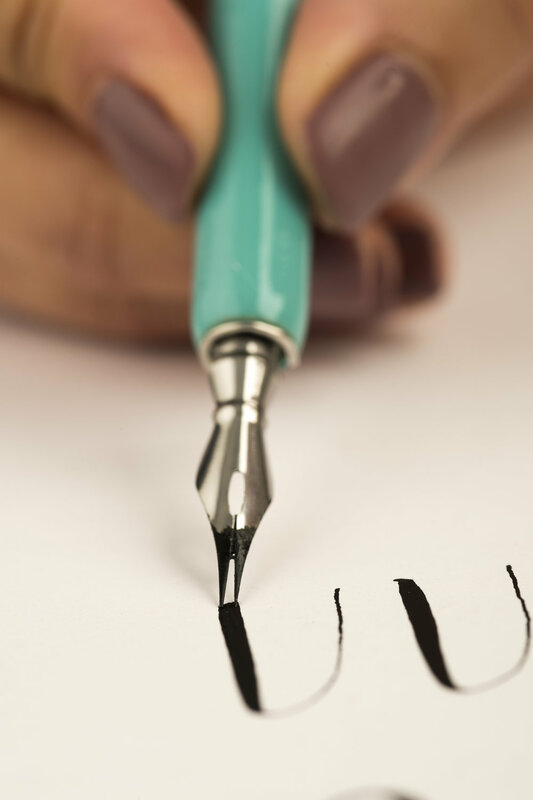 Enjoy the ink travelling across the paper and you will find that you are creating beautiful calligraphy in no time! If you are in the South of England, why not come along to one of our workshops and enjoy learning more, and meeting fellow calligraphy enthusiasts? We have full day and half day courses, all are friendly and informal. All abilities welcome and all materials are provided. Click to view workshop dates.